Dear Reader, My name is Luc van Bommel, I'm 20 years old and I'm from Venray, the Netherlands. 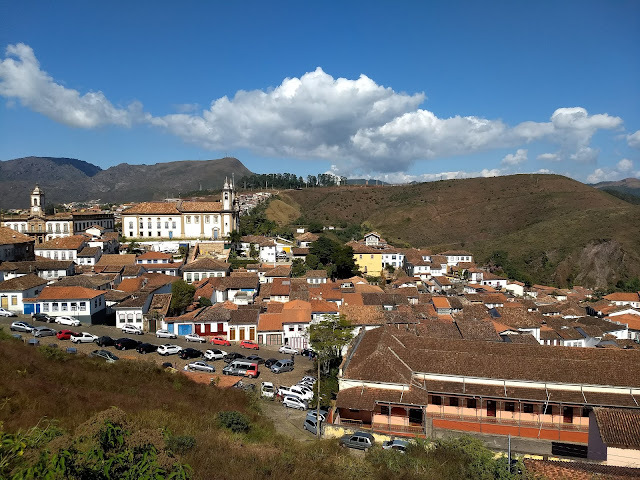 Welcome to my blog about my internship (or exchange programme) in Viçosa, Minas Gerais, Brazil. 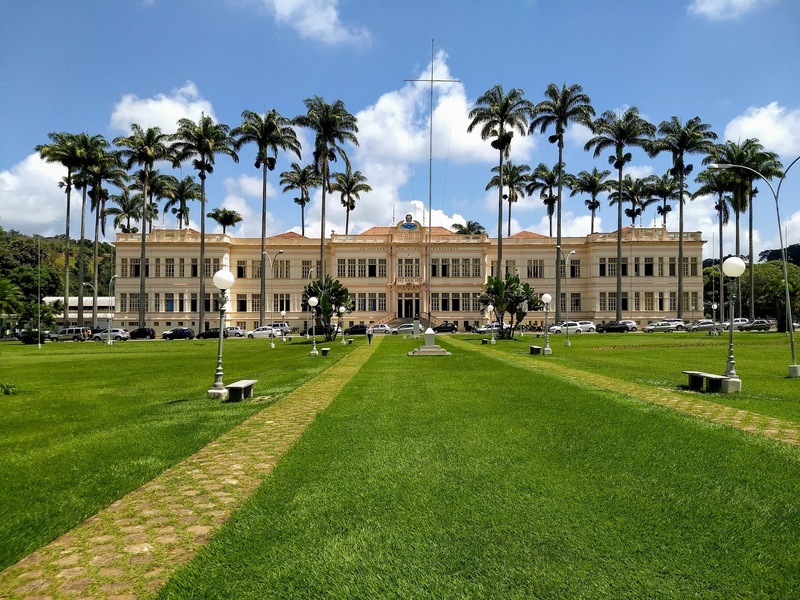 From February to August 2018, I will be doing this internship abroad at Universidade Federal de Viçosa, which is part of my study programme of HAS University of Applied Sciences. Let's make a story! Enjoy reading! Troca de Saberes and saying goodbyes! This is my final blog post in Brazil, because tomorrow I'm leaving Viçosa to take the plane home from Rio de Janeiro the day after tomorrow. But before I go, I'd like to mention some of the events of the past month and a half. 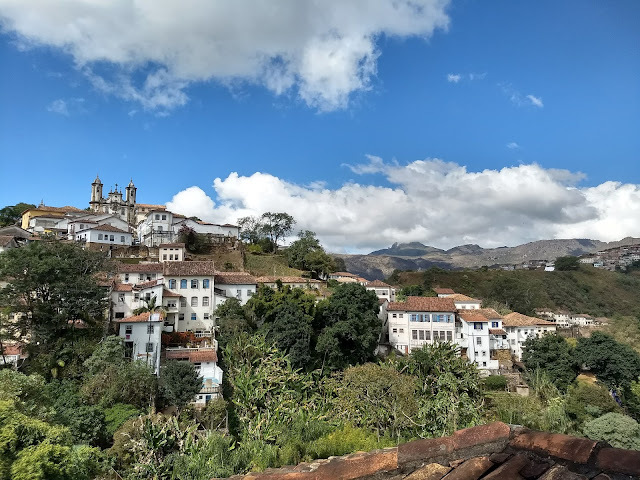 To start with, I went to the historical city of Ouro Preto with Layla. Ouro Preto's historical centre is part of the World Heritage List because of its well-preserved colonial appearance and old buildings and streets. It was an important city during the time of colonisation in Brazil. Ouro Preto is not just a very beautiful place to visit, but also a place where you can learn a lot about Brazil's history! 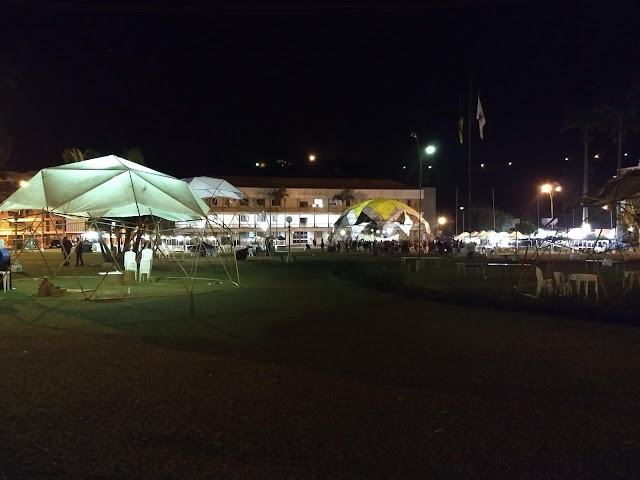 After this little trip, it was time for the last preparations of Troca de Saberes (Exchange of Knowledge) at the Semana do Fazendeiro (Farmer's week) at UFV. This was the tenth edition of Troca de Saberes and it was a big success. 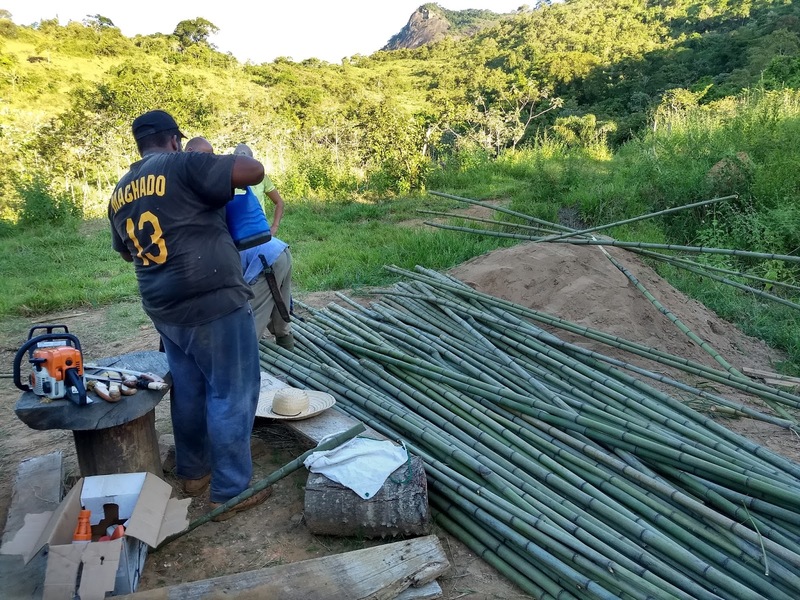 There were several tasks which had to be done, of which building up the huge bamboo constructions (see pictures) was the biggest job. It was a very nice experience to organise such an event in Brazil, because it's completely different than the Dutch way of organising and building up an event of this size. Honestly, I had to get used to the Brazilian way a little bit, because sometimes I had the feeling we didn't really have a planning. Soon I noticed no-one was getting worried, so why would I be? We did have fun building it up, and because you have to work together, this was the best way of practising Portuguese. 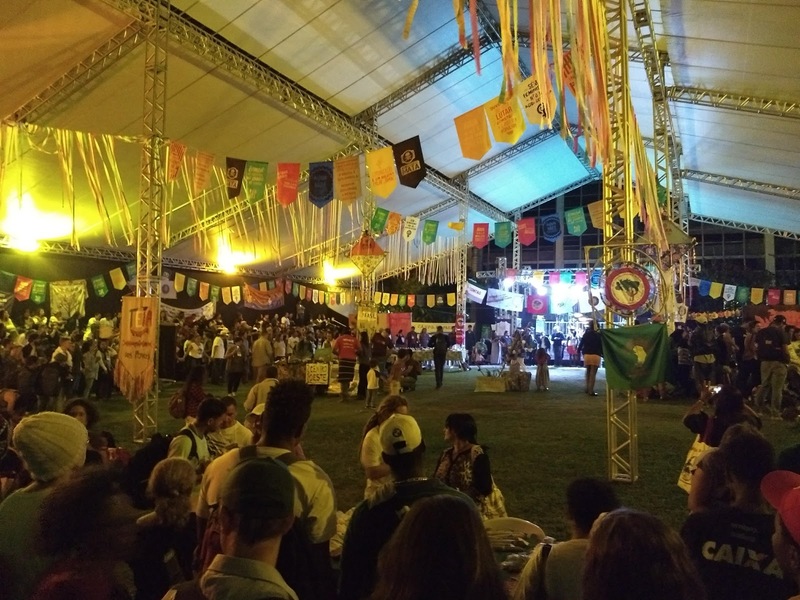 During the event itself, farmers from all over Minas Gerais (mainly Zona da Mata), and some people from other Brazilian states, came to Viçosa to visit Troca de Saberes. The main goal of this event was to exchange and spread knowledge about agroecology. Agroecology can be devided into three parts: Movement (in order to spread knowledge and the importance of integrating agriculture and ecology), Practice (the traditional knowledge of small family farms to manage biodiversity and agroecosystems) and Science (in short, agroecology is the science that studies agroecosystems). I can tell you a lot more about this! ;) The event itself was a great experience. 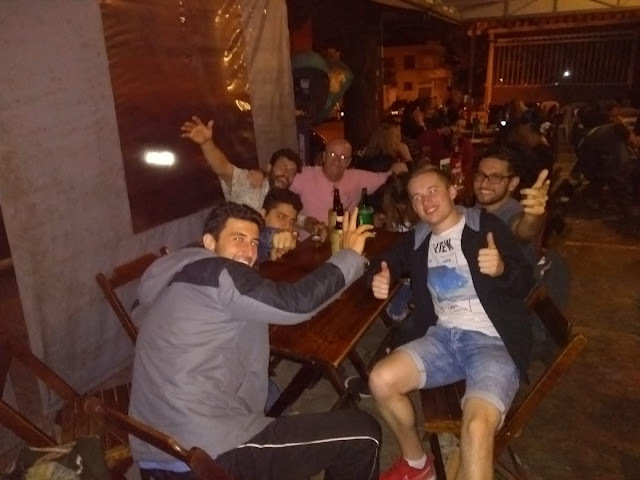 During the days we had different organsing tasks to do, but there was always time for some cachaça! In the evening there were different cultural programmes, like for instance Samba. Thank you colleagues of Troca de Saberes for the pleasant cooperation! 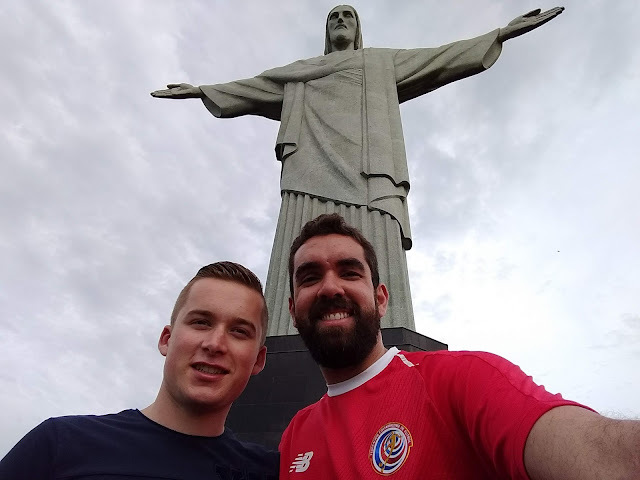 Last weekend I visited Rio de Janeiro together with Micael. 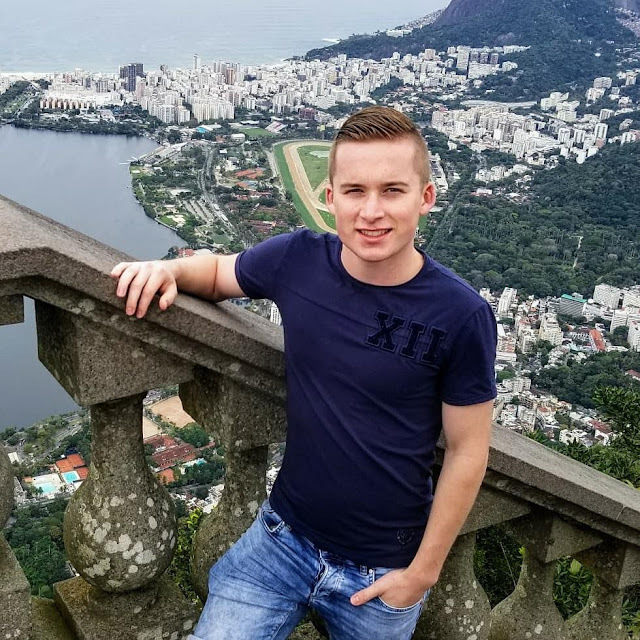 It was a last-minute decision, because Micael convinced me I can't leave Brazil without having brought a visit to Rio de Janeiro. Turns out he was right, because it really is a beautiful city! We stayed in Copacabana for two nights and when we arrrrrrived in Rrrrrrio in the first evening, we took a walk across the beach. The day after we visited Christ the Redeemer and the Sugarloaf mountain. On the last day I visited the Museum of Tomorrow, which I can really recommend to everyone who goes to Rio. Tonight is my goodbye party in our republic. It's hard to describe this feeling of having to leave home for the second time in half a year, and go home to a place I haven't seen or experienced for the same amount of time. The past six months were unbelievably incredible! 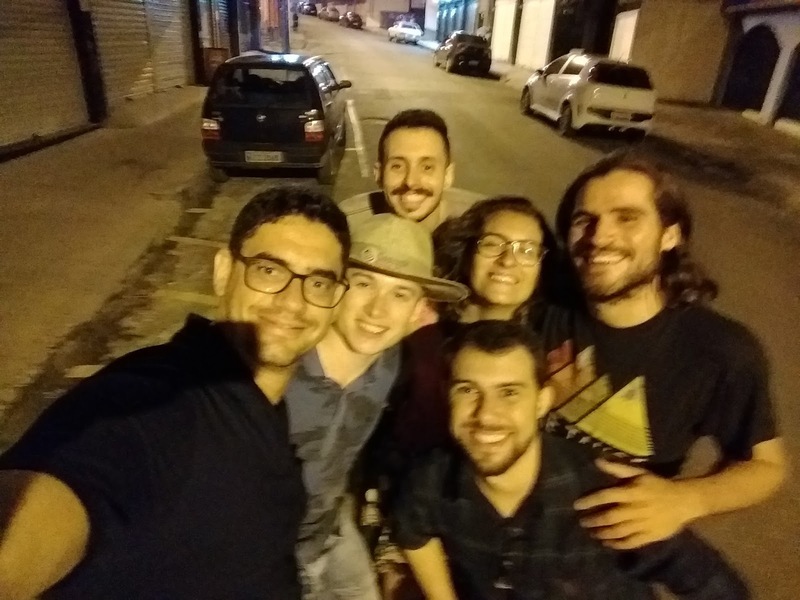 I'm very happy and grateful that I have been able to experience this and I'm going to miss Brazil, and especially Viçosa a lot! And this is mainly because of everyone who I met and who made me feel familiar here, and everyone who I made friendships with. Tonight we're going to drink a couple on the amazing time we spent here! It has been quite some time since my previous post, but here we go again! 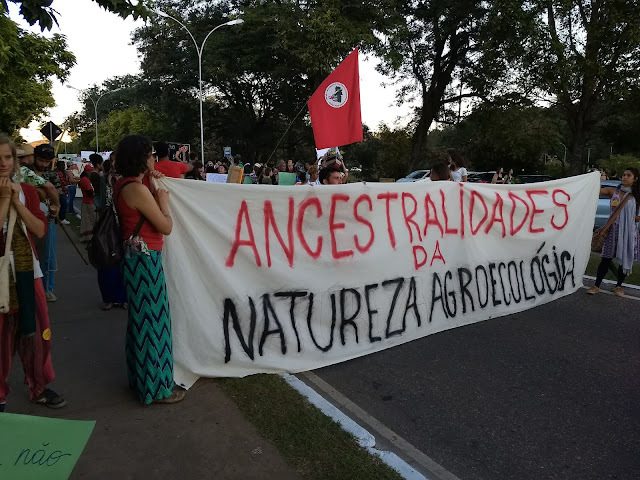 One month ago, there was a national meeting of agroecology in Minas' capital: Belo Horizonte. At the same time, there was a truck strike going on in the whole country. Because of rising gas and diesel prices, truck drivers striked during 11 days, with all its consequences... Supermarkets ran out of (mainly fresh) products, traveling became very difficult, universities and schools were closed for some days... The whole country stood still basically. The underlying meaning of the strike was to put pressure on the government and some wanted to force a military coup with it. In the end, lastly named didn't happen, fortunately. The damage is great however, and to compensate the happening, education and health care are cut. Exactly the sectors where Brazilians want more money. UFV was also closed for some days and the supermarkets here ran out of fresh products too. The one and only good thing was that those damn' noisy motor cycles were silent for some days ;p. Since I was planning to go to ENA (Encontro Nacional de Agroecologia) in Belo Horizonte, it might become difficult to get there because of the lack of fuels. That's why we decided to one day earlier, because some UFV busses were able to go there. The first day I spent in a paradise in the hills of BH, which was phenomenal! Then I went to a hostel in the centre of the city, close to ENA. At the hostel, there were mainly other young people who were very nice. So we immediately decided to go out for a Sertanejo bar. The next morning, me and one of the other guests, Daniel, went to ENA. This event hosts farmers, professors, students and other interested people to unite and discuss all topics that have to do with agroecology. In the afternoon I visited a symposium and I met other UFV 'colleagues'. The next morning, I first went to the Parque Municipal, where ENA was located. In the afternoon, I decided to go for some sightseeing in BH. The first museum I went to, I met Daniel and four other Environmental Engineering students from a university in Sao Paulo (who also stayed in the same hostel as me): Gabriel, Andre, Fernando and Tiago. 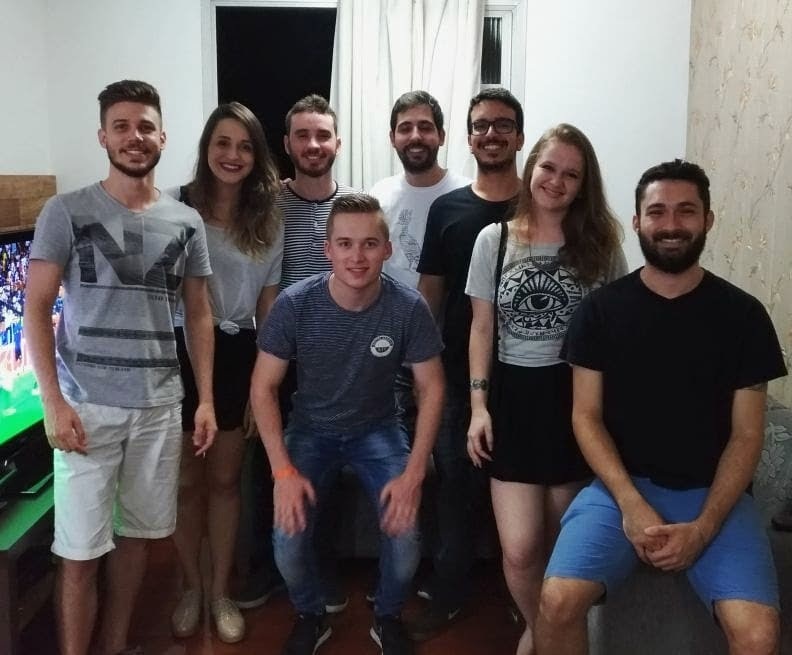 They were also in Belo Horizonte to go to ENA. Together we visited some other places (by bicycle! STOP) and after we had lunch at the famous Mercado Central, we headed back for ENA. After a short night, we went back for the last morning of ENA, where there was an agroecological market going on. 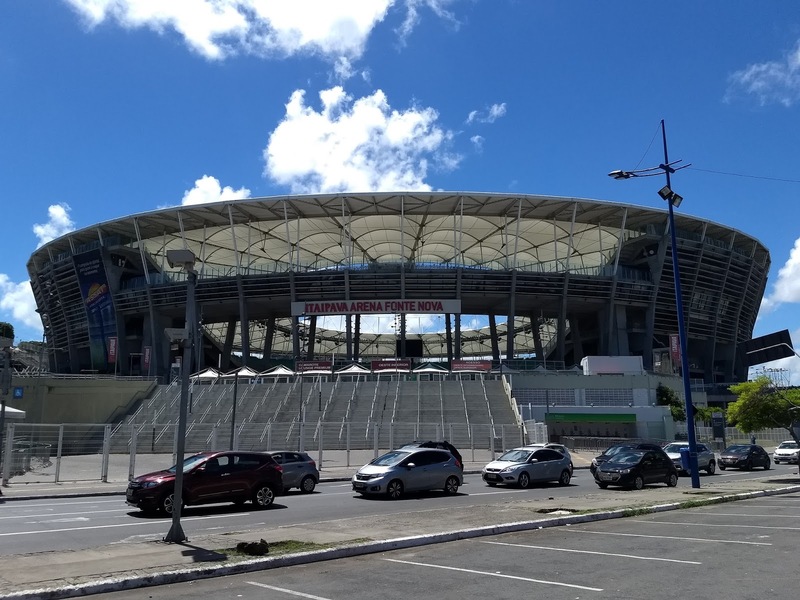 During the afternoon we planned to go to Pampulha ecological park, but because of the approaching sunset, and because our Uber driver told us about a football match going on, we went to a game of América FC. In the evening I headed back for Vicosa, with very nice company. 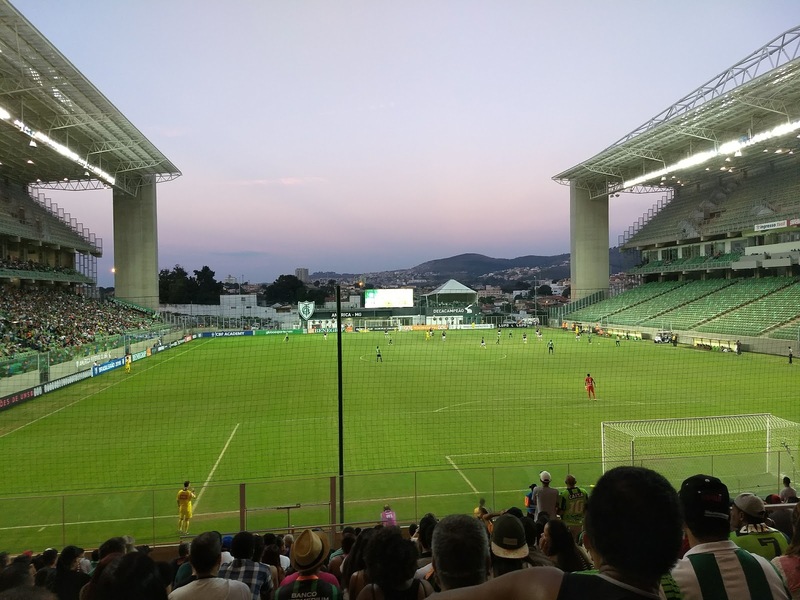 The good thing about the arrival was that it felt like coming home again: Vicosa meu país! After ENA, June had started. June is the month of Festa Junina (June festival). The festival has catholic roots, and it's only celebrated in Brazil. The festival features typical clothing, dance and food. This year June is also the month of the start of the World Cup football, in which the Netherlands are, if we put it in a positive way, conspicuous by their absence. But no worries, there's another team to cheer for ;). In the Netherlands we have a term called: "Orange fever" (Oranjekoorts). It's used when the Netherlands is going to participate at a big final tournament (yeah, had to dig deep for finding the term, indeed ;)). People get excited before every match our national team has to play, and you'll see a lot of orange on the streets. But let me tell you this, Dutch friends: Orange fever is nothing compared to Brazil's way of living towards and during the World Cup. But don't name it "yellow fever", because that is an actual disease. Better name it "Canary Madness" or something. And then about the Festa Junina. Last weekend we had two Junina parties. One on Saturday at the UFV campus, and one on Sunday, organised by the Forrozear project. The one on Sunday was a celebration of last semester's project group, which we finished last Friday. I'd hereby like to say a very big thank you to all the teachers who taught us Forró. Thank you! It always was a class to look out for. The Festas Junina were very nice typical Brazilian parties, which had something "vintage" because of the whole entourage, with for instance the clothing and the quadrilha (square dance). 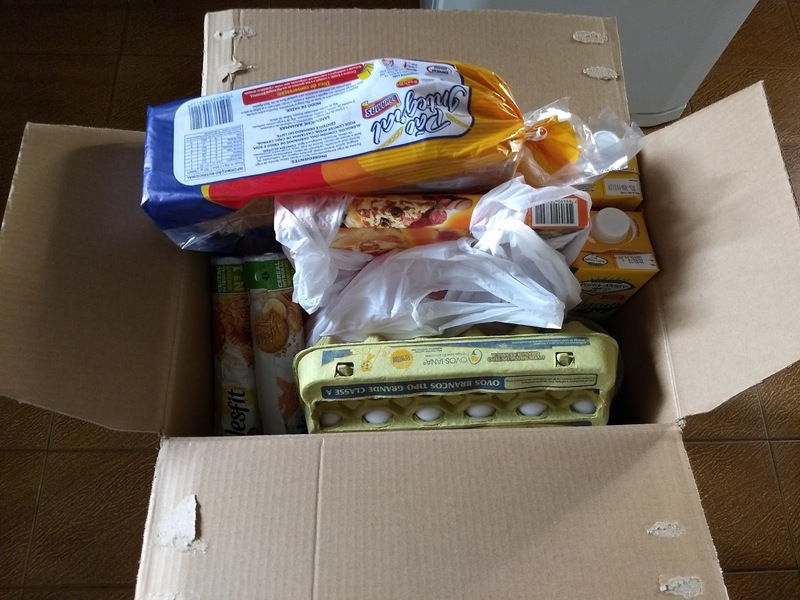 Here we go, another blog post! As promised in my previous blog post, I will start about the presentation I gave on May 3rd at the request of Embaixadores UFV (the ambassadors' group of UFV), every foreign student who comes to UFV, "gets" one ambassador appointed to help him or her with everything that has to be taken care of (for example a room, the first guided tours etc.). After the presentation I received many nice reactions, so thanks for your appreciations! It is getting colder in Viçosa in the evenings. Winter is coming here, while in the Netherlands temperatures are rising. Fortunately, during the day the weather is still very good. The weekend before my presentation, we had a regional agroecology meeting in Viçosa. People from all over Zona da Mata visited it. 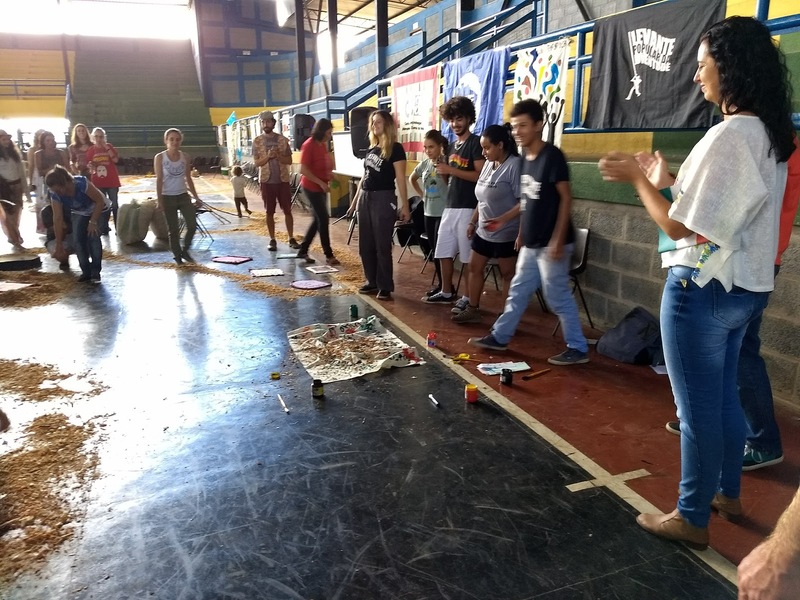 One of the goals was to discuss the National Agroecology Event in Belo Horizonte, which takes place at the end of this month. Also, all agroecology topics were presented by different groups of people. 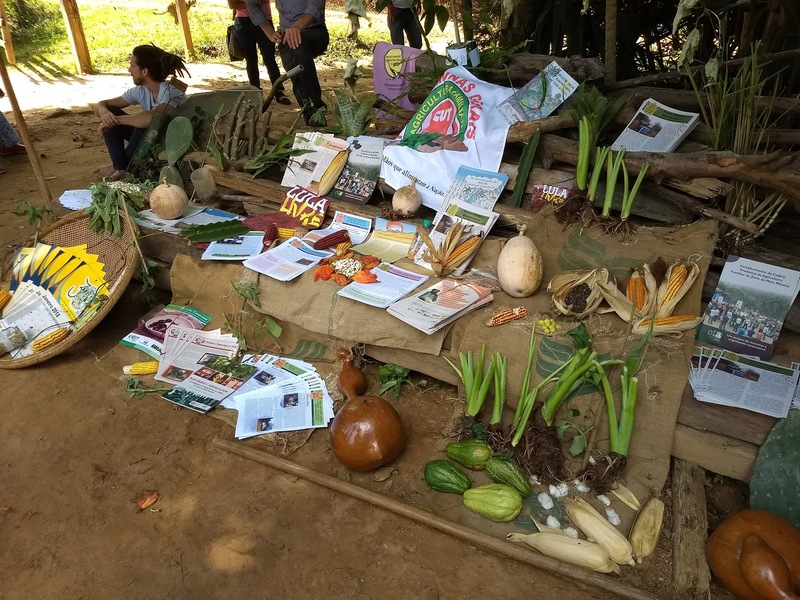 I got an even better impression of all the issues agroecology addresses, which is not just the transition of conventional, huge agricultural businesses to agroecology. Also topics like LGBT are lit up, and that's a good thing. The weekend after, we had a 10-year anniversary meeting of Intercâmbio Agroecológico in Divino, Minas Gerais. We went there on a Saturday morning with some students. During this event I had more Dutch company, but to be honest, it wasn't very interesting for us. The main activity was talking in the form of a monologue. I was expecting more interaction and variations. A while ago, we went to the cinema with some friends. It was the first time I went to the cinema in Brazil. Fortunately the film was called 'A quiet place', so not a lot was said during the film. Makes it very easy to understand!That's it for now. See you soon! The last post was about our trip to Salvador and right after we came back to Vicosa, I was invited to go to capital no. 4. 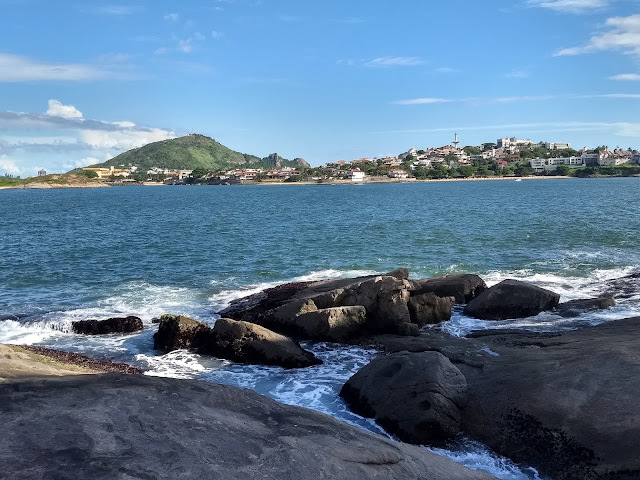 After Rio de Janeiro (capital of Rio de Janeiro) (which only was a stopover to go to Belo Horizonte), Belo Horizonte (capital of Minas Gerais) itself, and Salvador (capital of Bahia) we would go to Vítoria (capital of Espírito Santo) the next weekend. We were going to visit some friends and old housemates there. Together with Berginho, Tales and André we were going there by car. The trip was very nice and I was able to see a lot, especially of the state of Minas Gerais, which used to exist of forests completely. It was cut during the colonisation because during that time, the word 'environment' didn't exist at all. Minas Gerais is very hilly and most of the land is used for agriculture. During the trip we saw many coffee plantations and I was told that Minas produces one of the best types of coffee in the world. When we arrived in Vítoria we met Carolina, Catherine, Sávio and Heron and we had a nice evening with lots of laughter. The next day we went for a city trip by car and visited a rocky beach to see the view. In the evening we went to a party, which had something new: not just for the amazing view at the beach but also for the electric music. The next day we got up rather early to leave for Vicosa again. All in all it was a long travel for such a short trip, but the next day everyone had to go to university again. Even though it was a short trip, I can say that Vítoria is a beautiful city! Then about my internship: I booked some progress even though I had this delay that I talked about previously. Most of the work so far existed of a literature study. About the Troca (de Saberes): I'm understanding more about the meaning of this event. 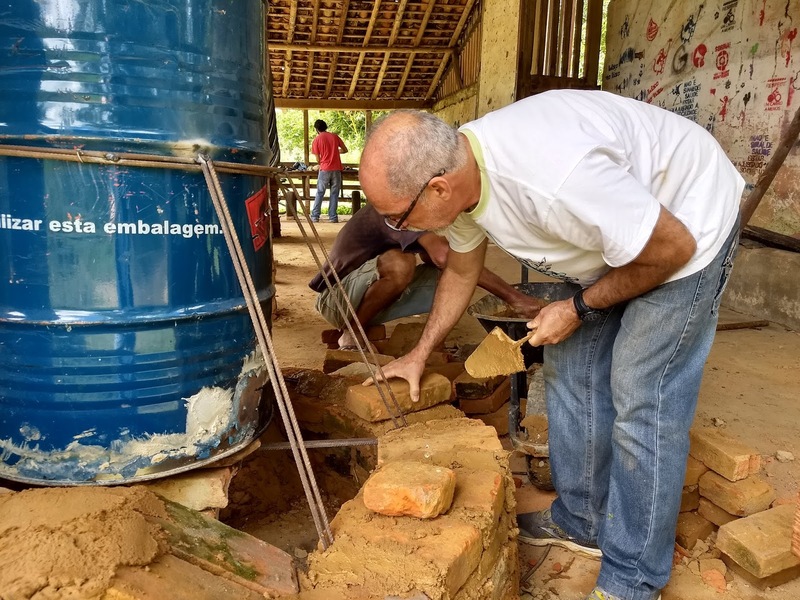 It's not just an Exchange of Knowledge (Troca de Saberes) during the Farmers' week at UFV. It's been an exchange of knowledge every meeting so far, since everybody has his or her input during the meetings. The only thing is that it's hard to understand the topics when you're learning Portuguese. There are many difficult and abstract topics to be discussed. I would compare it to reading a very difficult, technical text in my own language. You have to be really focussed or you won't know what you're reading actually. Sometimes, some of the other Brazilian participants even say: "What have I been reading here?" You can imagine that it's difficult for me to understand what's being discussed. When you're learning Portuguese it's easier to start with something like 'Nijntje' (or 'Miffy' in English)... Just to give you an idea. 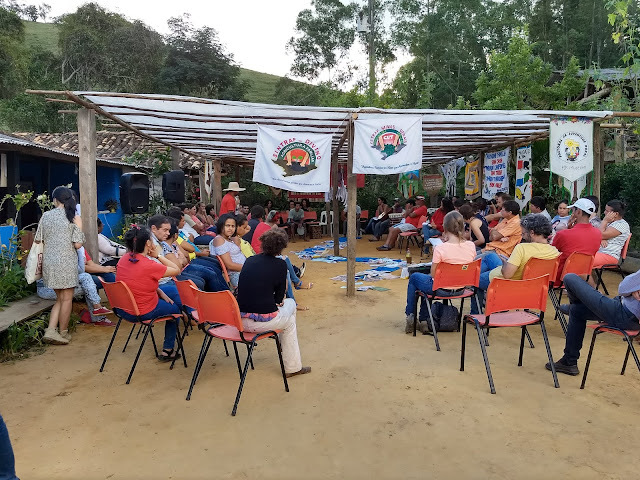 Last week we had a meeting in the middle terrain of UFV, to present what's Agroecology about. Next week on May 3rd, I will be giving a presentation about any topic I want. Since one of the conditions of our internships at HAS University is an assignment related to Health & Safety, I'm going to implement this (partially) in the presentation. Since my classmates who came here last year already discussed literally everything about the Dutch culture, I will be presenting about the European Union. I know, these seem to be tough subjects (and probably they are), but I will give it my best to make it interesting. In the next post, you'll read how the presentation went. Lucie in the Sky with Samba! Hereby I'm sharing another blog post! 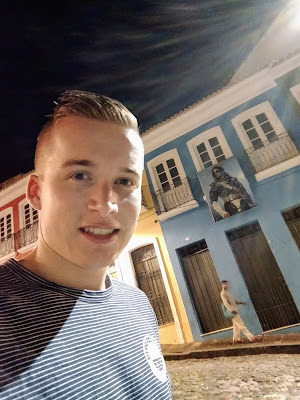 This post is mainly about my trip to Salvador with my comrades, but first I want to tell you something about a previous experience, the day before take-off. 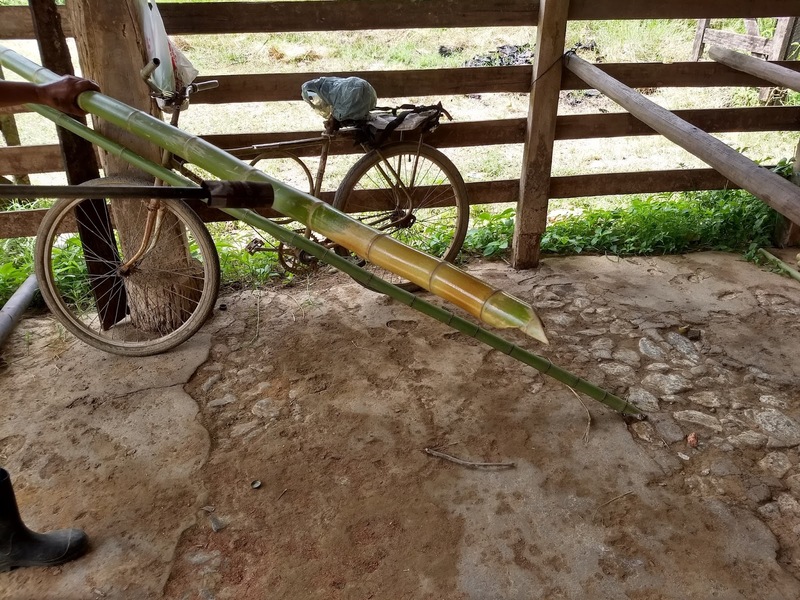 As I told you in my previous post, my internship will partially be a Life Cycle Assessment of bamboo. Wednesday morning at 5:00h one week ago, with two other students, known via the organising of Troca de Saberes: Fernanda and Daniel, we went to Assentamento Denis Gonçalves in Goianá, Minas Gerais. A 2.5-hour trip by car. With 4,000 ha of land, this used to be the biggest coffee farm in Brazil. It has been closed for decades and now it is the home place of several family farms. One of the practices nowadays, is bamboo farming. 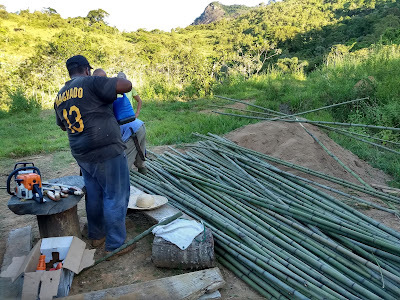 We went there to help the farmers with the processing of bamboo and the building of the oven, to get rid of the green resin on the bamboo sticks. The day ended a little excited though. 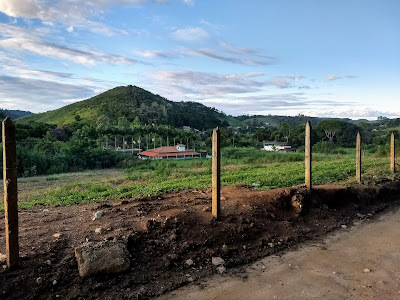 I didn't know that the people I drove with to Goianá from Viçosa, planned to sleep there to finish the jobs the other day. 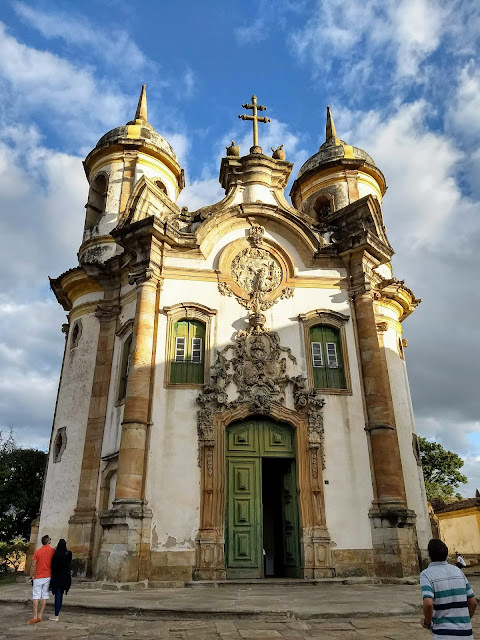 Now we had to find a way to get me in Viçosa, to catch the bus to go to Belo Horizonte the next day at 8:00, for our trip to Salvador da Bahia. Eventually we managed to stop a bus at 22:00h. At 00:30h I was at home in Viçosa, where a nice party was going on. The next morning, Gustavo, Elisabeth and me took the bus to Belo Horizonte. 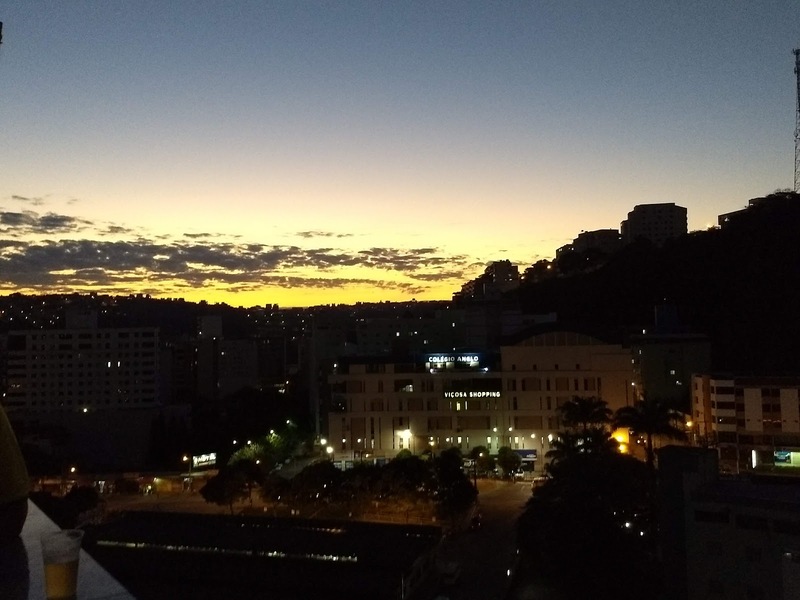 After spending the afternoon in Belo Horizonte, we took our flight to Salvador in the evening, where our trip was heading to. After a 1.5 hour flight, we landed in Salvador, Brazil's first capital. 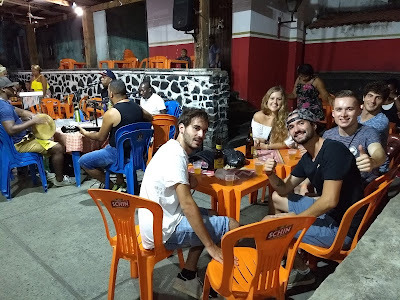 One hour later we arrived in Praia do Forte, where we met Silvana, Luca and Luca. The next day we spent in Praia do Forte, where we went surfing, great! It is a beautiful place. In the evening we took off for Salvador. My first impression of Salvador was that it's a modern city with all its new cars, roads, traffic lights, and buildings. But on the other end, there was a lot of poverty nearby. This contrast was very well visible in the whole city, it's very noticeable. 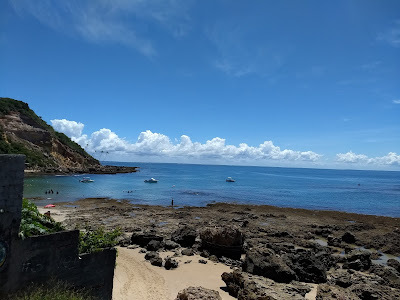 In Salvador we visited some beaches and did some sightseeing. The biggest place of interest probably is Pelourinho, which used to be an important colonial square in the centre of the former capital. It used to be the place where slaves were traded and also punished. 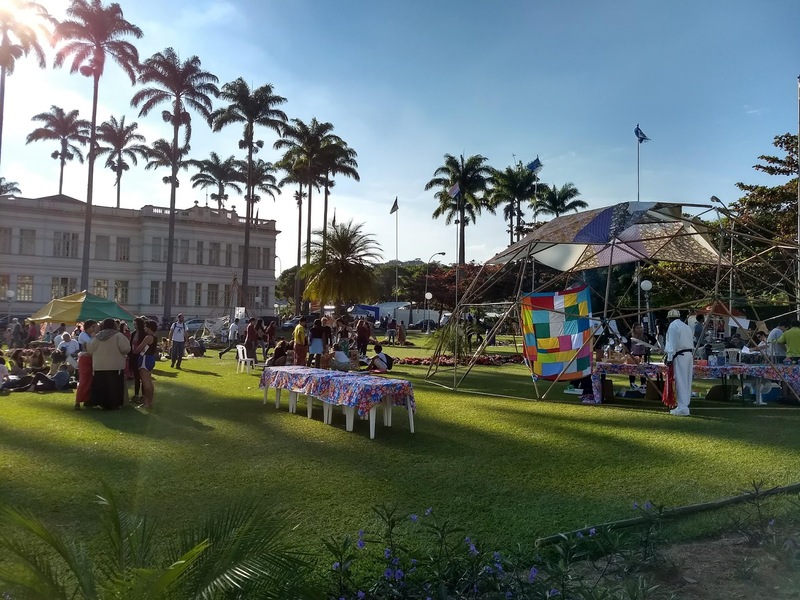 Today it is a center of Afro-Brazilian culture (and a tourist destination). 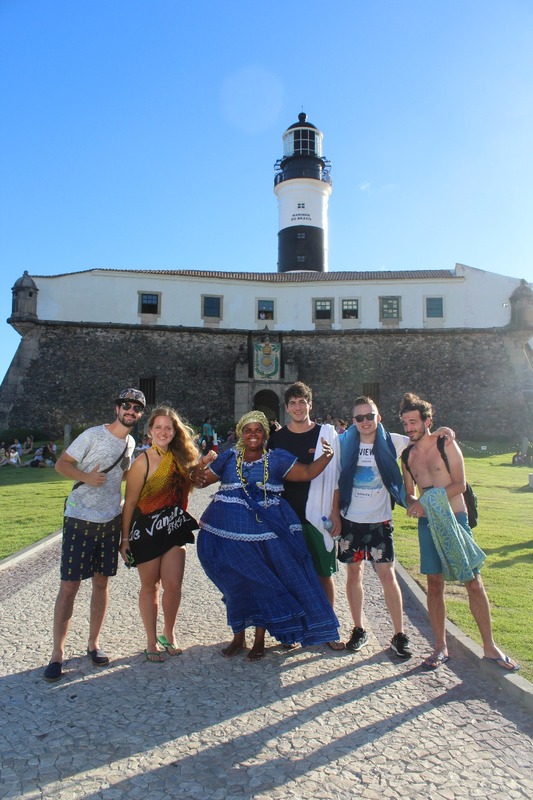 Due to its history, Salvador has a lot of inhabitants with African ancestry. Now is the time I've come to the title of this post. One evening we went to Pelourinho where we were searching for a place to eat. We ended up in a nice cozy eatery, where a band was playing Samba. I didn't know people really go dancing during the dinner, but at that place they did. Then you can't sit still on your own... So we got up too and that's how we became a part of the party. Samba isn't difficult, it's just very fast. But as a foreigner, you can't really fail, as long as you're participating. It was a great evening! One day, I decided to go to see the city by myself. 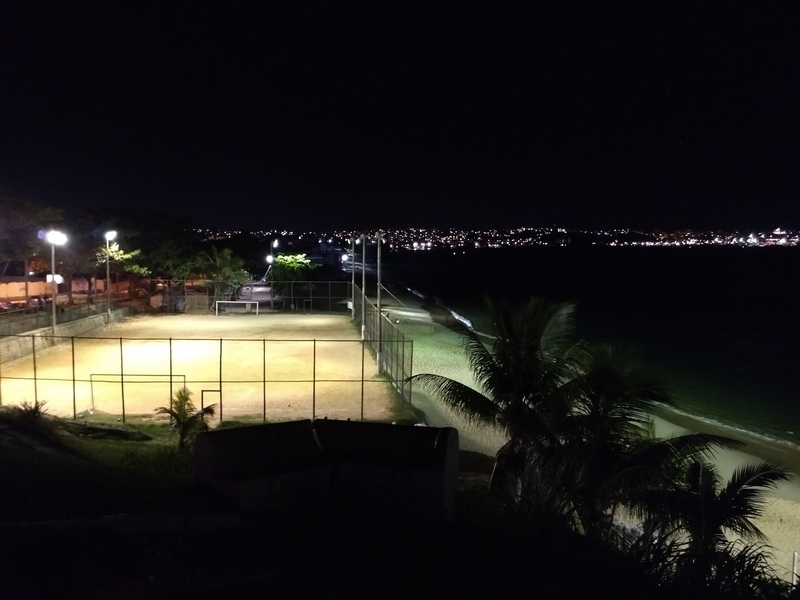 I started by going to Arena Fonte Nova, one of the twelve venues (play cities) of the 2014 FIFA World Cup. 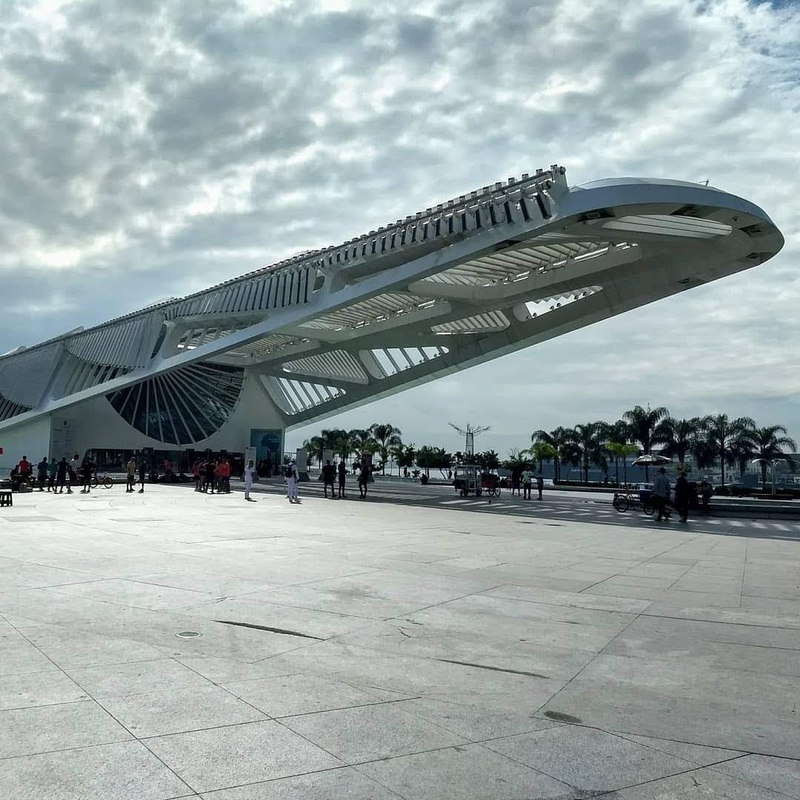 Arena Fonte Nova was the location of the legendary 5-1 victory of the Netherlands against Spain in better days. It was also the place of the goalkeeper change versus Costa Rica. After this, I decided to go to Mercado Modelo, another famous tourist spot. It's a market in a nice building where shirts and other souvenirs are sold. From there, I walked to Feira São Joaquim, a market (fair), where mainly agricultural products are traded. During my walk I saw a lot of poverty again, not what I imagined beforehand. But it was very visible during the whole trip. The penultimate day we went to Morro de São Paulo, on the island Tinharé, about 100 km south of Salvador. This is also a very important place in the history of Brazil. 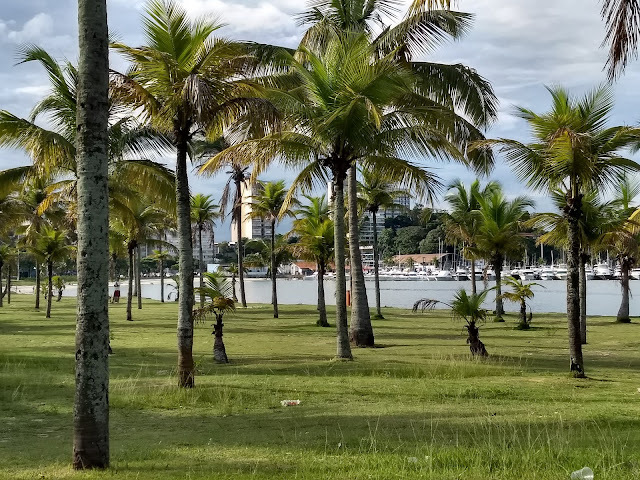 In the mid-16th century, the Portuguese founded a port here to supply the ships from and to Europe and to have a base in the interior of Brazil. Soon the island became a true center for various sea battles, which took place between the Portuguese, Dutch, French and pirates from the region. 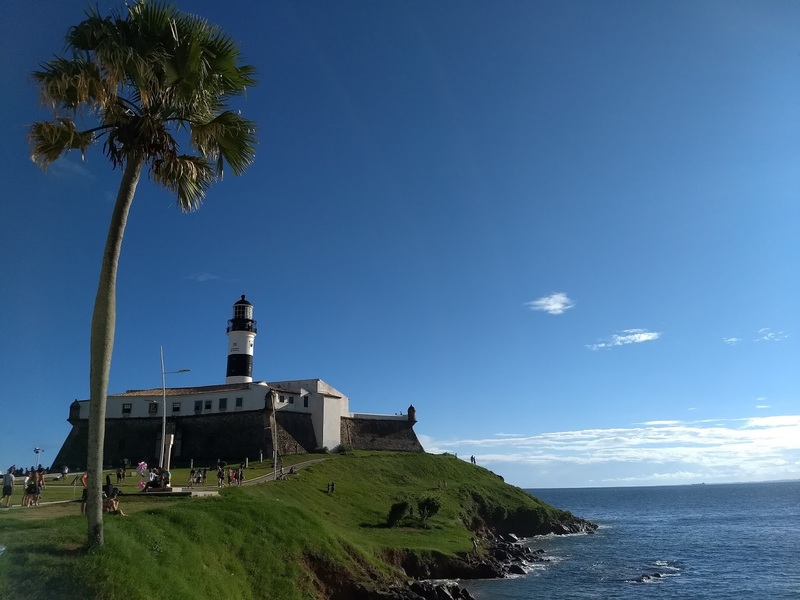 After the city was completely destroyed by the Dutch in the beginning of the 17th century, the Portuguese built a fort, which helped them to keep the city in Portuguese hands. Nowadays, it is a tourist spot with nice beaches. I think it is a little bit too touristy. But still, it was really beautiful. 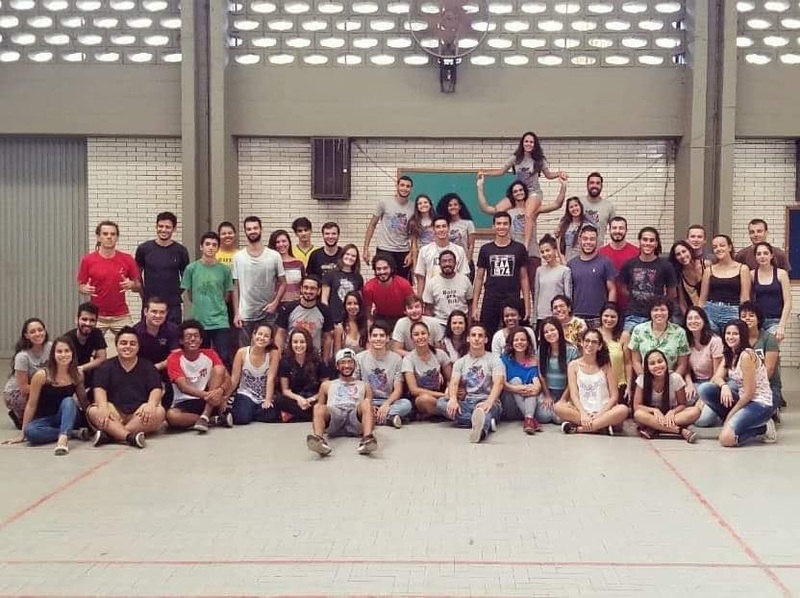 During our last day, we went to Pelourinho again, where we saw a group of people playing Capoeira, an Afro-Brazilian martial art, that combines elements of dance, acrobatics and music. Some capoeiristas nodded to us to come and play with them. So that's what we did. Another nice experience! One time, when we went back home in the night, I saw a group of 20 people playing football on a pitch at 1:30h! Those crazy Brazilians! 😂 I completely agree with them, because during the day it's way too warm to play football. When it's 30 °C with an even higher feeling temperature and a very powerful sun, it's not the time to play football. As you can imagine, it was a very amusing trip to Salvador! Now it's back to work again. Thanks for reading again and take care! Hello everyone and welcome to another blog post! 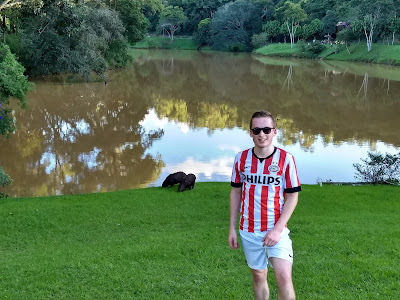 It's been more than a month now that I've started this adventure in Brazil. I think it has been the most eventful month of my - in the meantime - 21 year life. Because that was the topic I ended my last blog post with: my birthday. 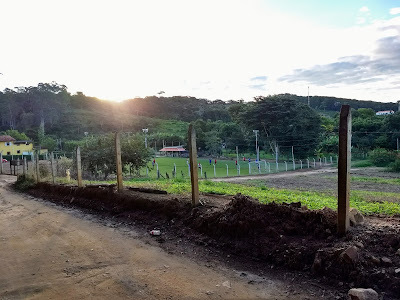 On Saturday morning, March 17th, after a short night, I went to CTA (Centro de Tecnologias Alternativas da Zona da Mata) with some students of the working group on agroforestry, named Grupo Apeti de Agroflorestas. We got there by bike and I think it was the most special bicycle tour of my life. 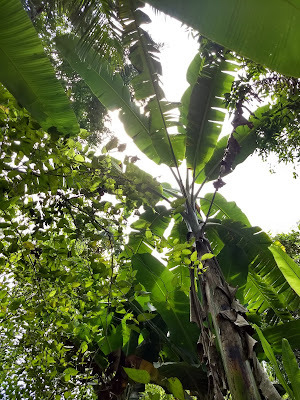 We cycled through a beautiful place of rainforest: Recanto das Cigarras (literally translated as "Cicadas' Corner", or "Hoek van de Cicaden" in Dutch). It's named this way because you can hear the cidadas very loudly. I would compare this sound with the sound of crickets (in Dutch: krekelgeluid), but much louder. During the bike trip we also heard some monkeys... Pretty awesome to start your birthday this way. When we arrived at CTA, we worked on the surrounding forest, we gathered dead and overflowing plant material and spread them on top of the bare ground, to increase the organic matter of the top layer. We also had a taste of mangoes and passion fruit. Amazing! After the same beautiful trip back home during midday, we had lunch and relaxed a bit: everybody was tired. 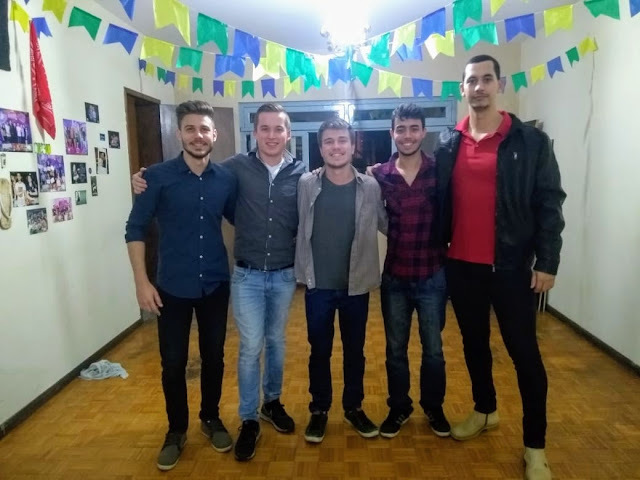 In the evening, just before going to a Calourada, a nice surprise awaited me when my housemates got me a real Brazilian cake and salgadinhos (snacks). It was a birthday I'll never forget! Thanks everybody! 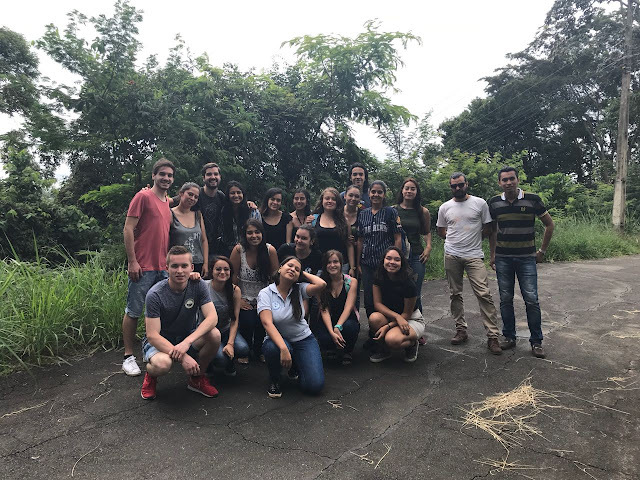 Last week I got to know the groups of the Agroecology department at UFV: GAO (Group of Agroecology and organic farming), SAUIPE (Group of Integral Health in Permaculture) and Grupo Apeti de Agroflorestas (Group of Agroforestry). I'm participating with these groups, but I mustn't forget my other assignments too. One of them is participating in the organisation of 'Troca de Saberes' (In English: Exchange of Knowledge), which will take place during the annual and national 'Farmer's week' in mid July at UFV. With a group of students and some professors, there's a weekly meeting in which the event will be build up bit by bit. In smaller groups of students, different themes are taken care of. I'm also expected to carry out a research study, which will be a life-cycle assessment on the production of bamboo. 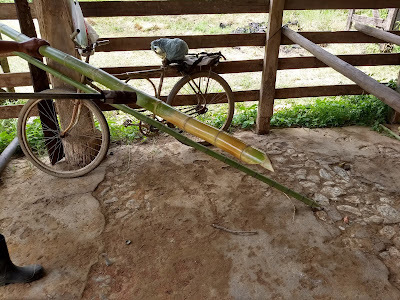 Tomorrow we are going to a small bamboo farm, to see what it takes to produce bamboo. Something else: Forró (Brazilian music and dance style). Yes, you've read it correctly: Dance style. Many people told me I should try, so I thought: let's give it a go! In the picture, you can see Micael and me in the dance room. Micael is a teacher of Forró and he helped me with my inscription. I'm going to take this opportunity to give it my best shot! 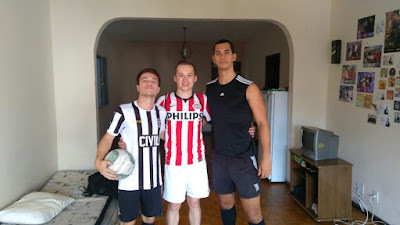 Last Sunday we went to play football with some housemates and friends. It was hard for the gringo to deal with the heat, but in the end, it was nice to play. When we went home, we came across two capybaras! Another nice prospect: Coming Thursday we're going to Salvador de Bahia until the following Wednesday. Coming thursday and friday are holidays in Brazil due to Maundy Thursday and Good Friday. Together with Luca, Luca, Elisabeth, Silvana and Gustavo we're going for this citytrip. We (six people, five nationalities) are all looking forward to this trip a lot! In the next post I will write about our travel to Salvador de Bahia. First of all my laptop's keyboard had some issues which got bigger after my first blogpost. After I had brought it to a computer store three times without results, I decided to buy a laptop three days ago, which I'm using now. The only thing is that Windows and Microsoft Office are completely in Portuguese, lucky me because I need to learn Portuguese... and FAST. Also I bought myself a bicycle, but I had to go back three times already because it had some issues. It's hard to find a good and not too expensive bike. I had some more challenges that I had to fight myself through, but now it's time for the good things that happened. 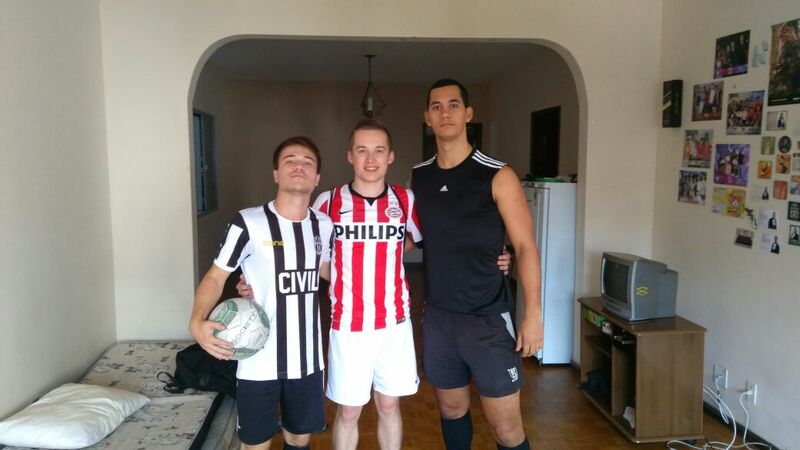 To start with: All housemates have arrived safely: Matheus (aka Cebolinha), Douglas (Douginha) and Valentim (Vaval). Bruno (BB), Matheus (Berginho) and me (Gringo) were already here. A total of 6 fellas who get along very well. We already found out that translating jokes from Dutch to English or from Portuguese to English doesn't work out. The sense is just lost. And now, back to school! So, my project will be at the Agroecology department. It will have more than one aspect. 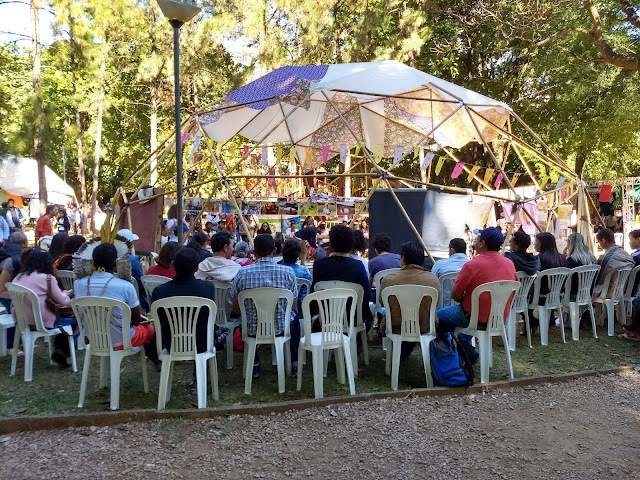 The first part is organising a national event of agroecology in Belo Horizonte, which is called Encontro Nacional de Agroecologia (ENA). 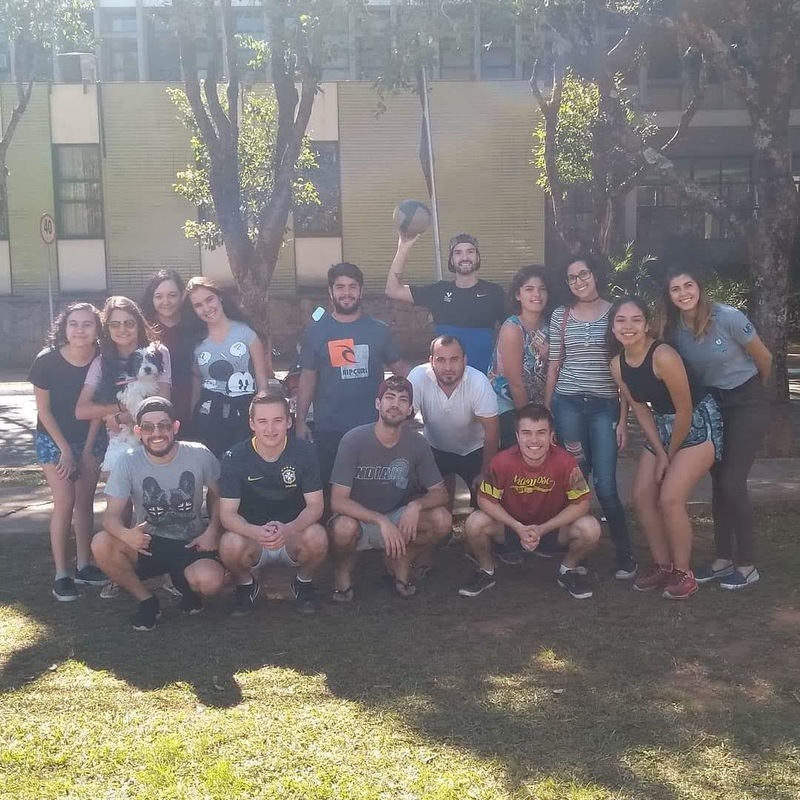 With a group of students and professors, the event is organised by arranging everything in weekly meetings (which are in Portuguese, so very hard to understand). These meetings also have a spiritual character, which I think can be good for your personal development. The second part is to be determined in the following two weeks. It could be another assignment related to agroecology, or it's going to be a chain research related to for example the coffee or dairy industry, which are huge in Brazil. For both assignments it is essential that I develop my level of Portuguese quickly. Coming Monday I will start with Portuguese classes, twice a week at the department of lettres. In other words: There's a lot of work to be done and things to clarified. 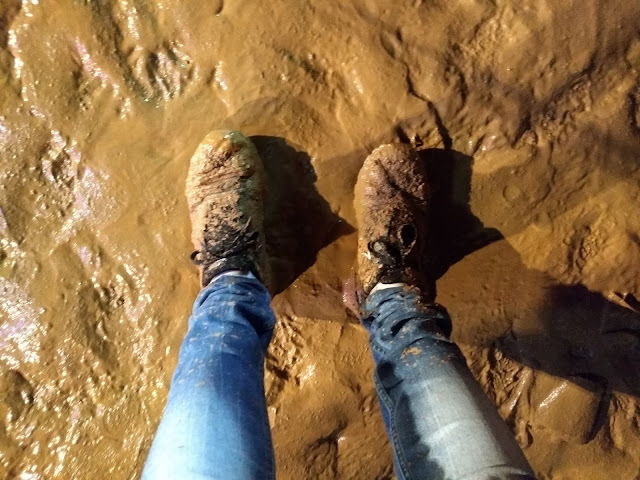 Via the group of ambassadors, a tour through the whole university terrain was organised. We got a nice view of all the beauty of UFV. As Vínicius said, it's an opportunity to change the use of all the plastic, I think it's possible. 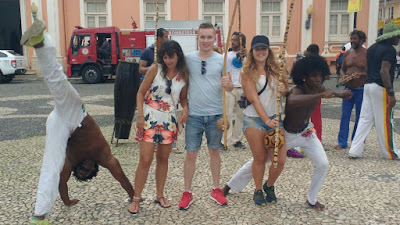 I experienced many more things of the Brazilian culture which surprised me a lot. Sometimes it made me laugh, like the habbit to light up your car's safety lights to let everybody (authorisations included) know that you're not parking at that spot for a long time. We use these blue parking cards, safety lights can last for more than a day on your car's battery! 😂. 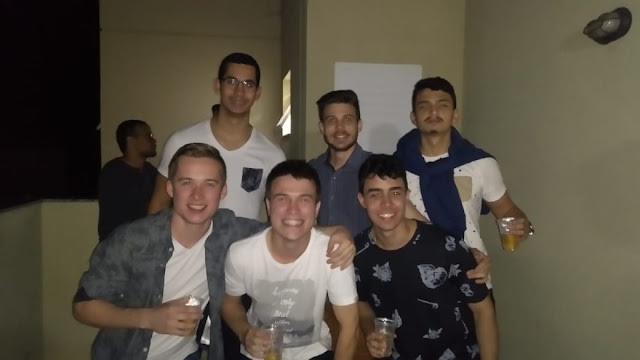 My first Calourada (Freshman party). 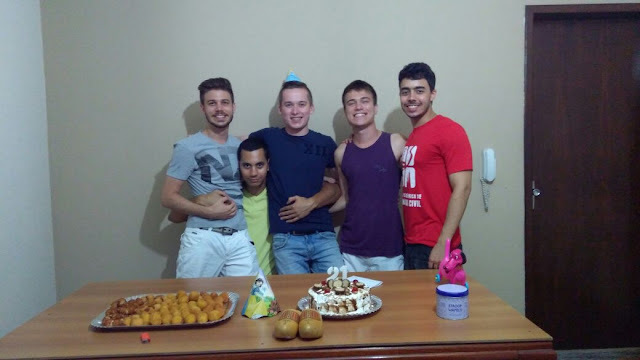 Last weekend we had a party at our house to celebrate the birthdays of Cebolinha, Camila and me. The party was nice and it ended beautifully, with my new friends we made some music on the street. It was another great experience! Yesterday morning, Anibal and me headed for the federal police in Juiz de Fora (4 hours and 20 minutes by bus), because of arranging our legal stay, which you have to do within 30 days of your arrival. The day before yesterday I got a flu, so I felt bad. Yesterday was tough, but we made it. I was happy to catch some sleep after the same trip home: 4 hours and 20 minutes. Today I'm feeling better, I hope to be back to 100% before my birthday this weekend. Probably I have forgotten many things that happened, but they will be discussed in the next posts. 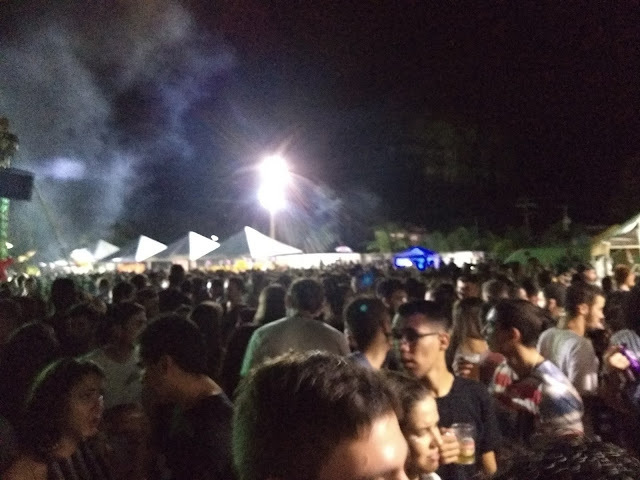 One of them just comes up: Don't ever try to put on some Dutch or European music on a party in Brazil, Brazilians just don't change their vibe: Funk. If you put on some nice house/DJ, electronic, rock, pop... Name it... You might as well turn off the power of the whole building. It will result in the same effect: People will stand still: the party will be killed. Fortunately, we got it up and running again. I want to say one last Thank You to all new people I met during my first three weeks here. You really made me feel at home. 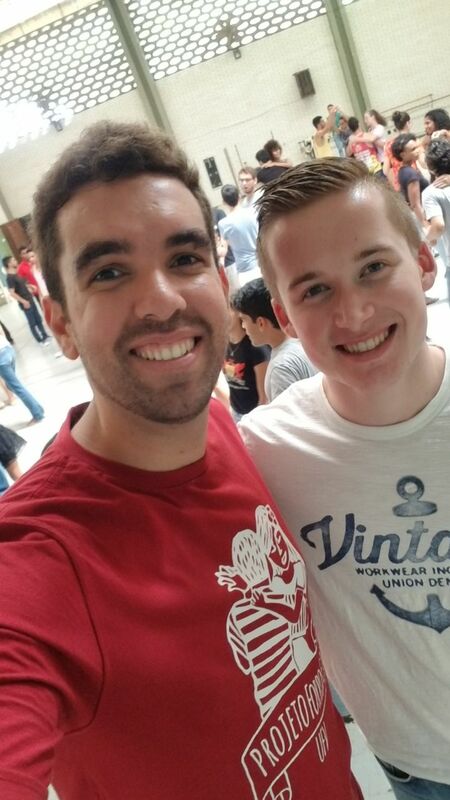 Muito Obrigado!! Thank you for reading again and the next post will be following soon!